In Part one we talked about looking at your IT team dynamics, thinking about how they worked both individually and as one IT unit. In Parts 2,3and 4 we spoke to some examples of areas which may indicate some holes within the processes these teams are following. Or in some cases not following as well as we may think. 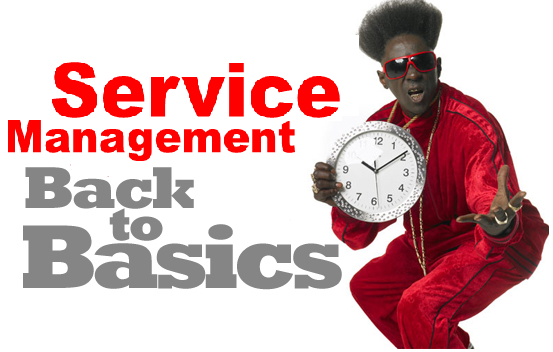 While I only spoke to a few examples and there will likely be others we are really trying to get to the "basics" of ITSM. No matter the size of your service management team whether you exist within a SMO (Service Management Office) or you are just starting out with a few people and processes it is going to take some work to identify and fill in some of the gaps that exist. You might not get it right the first time. That is ok as long as you can learn something from this and then use that information to improve on what you are doing. You need to start somewhere. Finding areas for improvement in the way that these processes work will enable you to identify some areas where you can improve the customer experience. Being able to clearly quantify where the improvements are will allow you to be in a better position to reach out to your operation and development counterparts to continue improvement initiatives. These IT counterparts will be far more receptive if we can verbalize ways to make the customer happy and streamlining what they already do. Ultimately you will be able to connect with the business to ensure that we are hitting the service delivery mark, but we need to walk before we can run. Start by determining your current state. The real question is that with the processes we execute, have we maximized the value from them yet? Not only reporting on ITSM processes individually but validating these against other processes. What gaps in our processes have surfaced after the review.